Following the abundant success of Fargo in 1996, the Coen Brothers faced considerable scrutiny about their highly anticipated follow-up to the Oscar-nominated gem. Would they create another dark, bloody story with comedic elements, or venture in a much different direction? 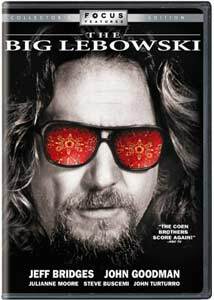 Thankfully, the brothers chose the second route and crafted The Big Lebowski�a unique, hilarious tale that portrays the strange days of Jeff Lebowski (Jeff Bridges), normally called The Dude. While it lacks the mainstream crowd-pleasing elements of its predecessor, this film is arguably the Coens� most effective creation. Released in March 1998, the clever mix of Raymond Chandler�s detective stories, hippie acid trips, and bowling deserves its lofty cult status. The story�s plot is fairly inconsequential and moves along at a slow pace, perfectly encapsulating the world of The Dude. Based on the Coens� friend Jeff Dowd (also referred to as �The Dude�), this plump, bearded stoner uses the term �man� a lot and spends much of the film worrying about his ruined rug. This goal is hardly typical for a lead character, which leads to numerous silly moments. The Dude is often frustrated by the crazy antics of his buddy Walter (John Goodman), a Vietnam veteran whose outlook is a bit different than normal people. They spend considerable time bowling with their buddy Donny (Steve Buscemi), a quiet guy who�s always arriving at the middle of every conversation. Their bowling adversaries include the purple-clothed Jesus (John Turturro) and mild-mannered Smokey (Jimmie Dale Gilmore). Throughout this story, The Dude does his share of casual drugs and participates in wild, colorful acid trips. So what actually happens in this film? The primary narrative involves the apparent abduction of the attractive young Bunny Lebowski (Tara Reid) by a group of nihilists. Mistaken for the rich and very large Jeffrey Lebowski (David Huddleston), The Dude is contacted by the nihilists, who want ransom money. Then the story becomes even more complicated and involves all types of scheming and odd events. At the center of everything is the wonderful Dude, who tries to be friendly and just wants everyone to chill out. He eventually meets up with Maude Lebowski, played by Julianne Moore in yet another quirky performance. The film�s narration comes from The Stranger (Sam Elliott), a cowboy who offers some poignant comments about the proceedings. Jeff Bridges shines as the entirely likable Dude and proves once again why he�s one of the most underrated actors working today. Book-ending this performance were much different roles as the romantic lead in the Streisand vehicle The Mirror Has Two Faces and as a paranoid neighbor in Arlington Road. Bridges has proven during his lengthy career that he can play almost any role and make it interesting. Coen regular John Goodman is remarkable once again as the swaggering Walter, especially during one classic scene involving his misguided destruction of a sports car. Numerous supporting characters make brief but memorable appearances, including Turturro, Elliott, Huddleston, and Philip Seymour Hoffman. Image Transfer Review: The Big Lebowski: Collector's Edition offers a 1.85:1 anamorphic widescreen transfer that improves considerably upon the original version. The colors are much sharper this time, and the significant grain and defects barely appear. The extravagant dream sequences are also much brighter, which helps to enhance their effectiveness. This transfer falls a bit below the premier level, but it still offers a better presentation in every regard. Audio Transfer Review: This disc includes the same 5.1-channel Dolby Digital transfer as the original release, which is only a mild disappointment. The track offers significant power from the front speakers as the collection of groovy tunes play, but it lacks the complexity needed to deserve a high grade. The dialogue is clear and understandable throughout the film, and no major problems exist, which warrants a solid recommendation. Extras Review: Unfortunately, the "Collector's Edition" aspects of this release are very disappointing and add little in terms of new extra features. The primary supplement is a 24-minute behind-the-scenes piece, but this documentary was included with the original release. This feature is comprised mostly of interviews with Joel and Ethan Coen concerning the creation and production process. Director of Photography Roger Deakens and several key actors also appear to provide their input. The film footage has a surprisingly poor quality and is usually in the full-frame format. The remaining extras include a new three-minute slide show of Jeff Bridges' black-and-white photography, a mock film introduction from Mortimer Young, and basic production notes. Bridges' pictures from the set include unique images from odd places on the set that vary from the typical photo galleries. The Big Lebowski: Collector's Edition offers an impressive visual transfer and a few minor new extras, but viewers who purchased the original release should probably take a pass. Devoted fans will undoubtedly want to pick up the Achiever's Edition, which includes a bowling towel, printed Jeff Bridges' photos, and coasters of The Dude, Walter, Donny, and Maude Lebowski. The collector's edition does offer a reasonable bargain for casual buyers, so it receives a solid recommendation.